for Kindle, exclusively at Amazon! Copies available for only $3.99. Helena novelist Stan Lynde has been awarded Western Writers of America's 2009 Spur Award for the original audio book of his novel, Vendetta Canyon. 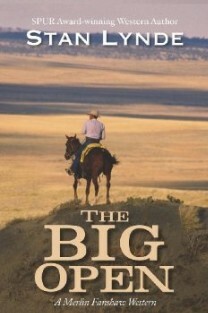 The Spur Awards, given annually for distinguished writing about the American West, are among the oldest and most prestigious awards in American literature. In notifying Lynde of his 2009 win, Spur Awards chairman Jim Ersfeld wrote, "Since 1953, the WWA Spur Awards have honored the best in western fiction, non-fiction, and script writing. We are honored to add you to this list of the most distinguished western writers of the last half century." Published by iUniverse in 2008 and recorded as an audiobook by Lynde for Books in Motion of Spokane, Wash., Vendetta Canyon is Lynde's seventh published novel and the sixth in his Merlin Fanshaw Western series. Lynde was a finalist in 2006 for his novel "Marshal of Medicine Lodge," and in 2007 for the audiobook of his novel "Summer Snow," but this year marks his first win of the coveted award.